so much nicer for the child receiving it if I can go the extra mile. We live in a small town with very few stores and my health is such that I rarely leave the house. So shopping great craft deals at stores year round is not an option for me. So the following is my plan on how to have cash to spend for my shoebox crafting. One of my favorite blog giveaway wins. Enter Blog Giveaways -- Goal: to add quality to my boxes. Any day that I have a few extra minutes I enter some blog giveaways. 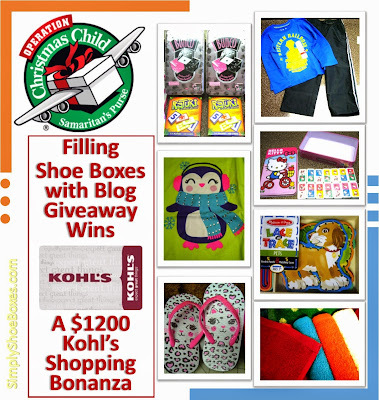 I have won gift cards, fabric, toys, shoes, jewelry and other fun items for my shoeboxes. The time spent and winnings vary greatly. There are long dry spells of no wins and then wins weekly. Since I don't spend much time on it now I rarely win, but I hope over the next shoebox packing year to be able to find at least 5 to 10 minutes a day to spend entering. It is a great way to get high quality items for my shoebox packing. I have written a post on How to Find and Enter Blog Giveaways if you are interested in learning more. Enter Crafted Items for Shoeboxes in the County Fair -- Goal: $10 to $30 a year. One way I am trying to earn a little extra is thru entering some of the things I have crafted in our local county fair. There is no entry fee and for sewn items the prizes are First - $6, Second - $5 and Third $4. This year I only had three things to enter: a dress, a skirt and a pencil bag (which I knew was most likely not to win since it was so small an item). I won two first place ribbons and a check for $12. Elizabeth won third place on a library bag she entered, so she gave me the $4 she won. We added a total of $16 to our budget. Three wins on five items isn't too bad. I think I will look at the different categories available and make things for my shoeboxes accordingly so we can earn more next year. My first purchase with money earned thru ways mentioned in this post: bulk ribbon, originally sold by the yard, from a closed craft store sold thru The Fabric & Yarn Lady on Etsy. I have decided to spend some specific time each day at sites that "pay" members for doing activities online and use it to pay for my craft supplies. They all offer points for activities that can be turned in for gift cards. 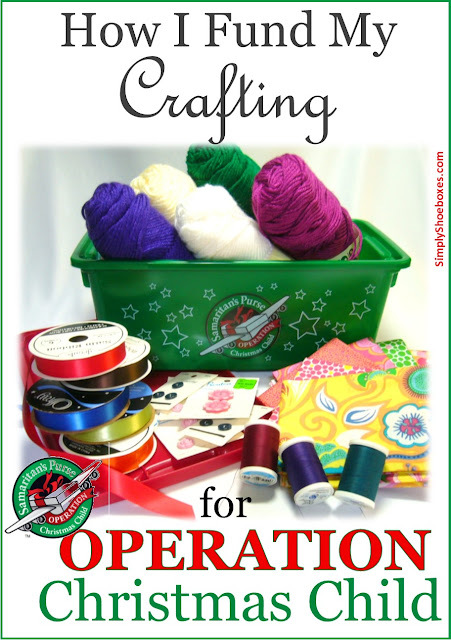 I use these gift cards for my Operation Christmas Child crafting or sometimes I use them for my family's shopping budget and take the cash to replace them. This way I can shop anywhere I want to. I thought some of you may like to earn a little extra cash so I'll share my daily routine so you can better decide if it is worth a try on your schedule. I don't want to spend too much time online doing this, so I have chosen to limit my time and thus limit my earnings. If I need a little extra cash for a specific crafting item or I'm close to cash out I'll spend a little more time doing other activities at one or two sites. There are people who spend a lot more time and earn a good bit of money. If I can accomplish the goals I have set, I think it is a good balance for me. Note: All of these sites are free to join. I have cashed out with no problems at all but have not cashed out at Dailybreak yet. I cash out at MyPoints for $5 CVS gift cards. At this time that is the best deal and since, as you can see from our other blog Simply CVS, we shop the deals there weekly it is a great fit. They do offer many more options. To earn this monthly I need to earn around 23 points a day. Below is how I do that. We've shared on our other blog How to Earn on MyPoints if you are interested in learning more. Sarah's haul from CVS 75% off clearance shopping. Aim for the Daily 5. If I do five of the daily activities listed on the site I earn an extra 5 points. Check for bonus emails--I've signed up to receive the BonusMail and I usually get one to four a day. Click thru the ones that say "earn 5 points" for visiting at the bottom. Not all offer this. Tip: I try to leave the last one or two in my inbox for the days I don't get any. This helps with the daily 5 bonus. Visit the advertiser listed in the Daily 5. Click on the "Discover a Deal" on the Daily 5. Click thru the "print a coupon" on the Daily 5. Sometimes I will print one and at different times of the year they have points for printing -- it varies. If I don't get the Daily 5 that way (because I have no emails) I will click on "Take a Survey." If there are questions on the right hand side I will work thru until I reach 10 and that will count. I will earn the 5 for answering and it will count towards the Daily 5. If there are no questions on the right I will try one of the surveys. I usually get disqualified and that counts, too. If I don't have time that day, I'll just miss filling in my Daily 5. Before I leave the site I will do a couple of web searches. I usually win points once or twice a week. We have earned hundreds of dollars over the years at Swagbucks (Sarah's referral link--see below). They offer dozens of ways to earn. I have weeded out most and limit myself to the quickest and easiest. Even with limiting my time, I can still earn at least $20 a month and most months $25. And because they offer dozens of different gift cards as well as Paypal it is perfect. 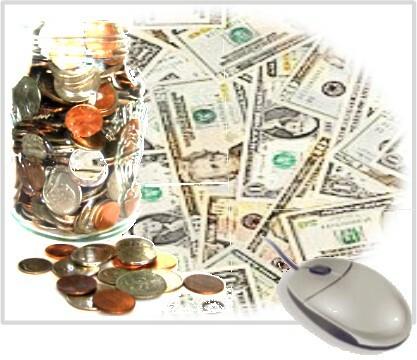 We have shared several posts at our other blog in the How to Earn at Swagbucks Series if you would like to learn more. Take one question daily poll. Click on deal of the day. Do two to three searches. Check Swagbucks Inbox for quick click deals. I have an old mobile phone no one is using that I downloaded their six video apps on. I keep this running all day long switching between the apps as I reach the limit for the day. I have unlimited home Wi-Fi so I don't have a data charge. This really helps the points add up. I have read of many people who buy cheap disposable phones just to earn thru Swagbucks Mobile Watch. Enter Swag Codes announced on Facebook -- usually once daily if I catch it before it expires. Monthly they have a mega-swag code day where I earn up to 40 points. Join Team Challenges [available each month] to earn bonus when cashing out. Participate in Swago Boards [available each month]. Earn daily bonuses for meeting goals set by Swagbucks -- only some days do I do this, but it helps a lot. Referrals -- I also earn a little from a couple of friends who have signed up under me. I earn 10% of what they earn on many activities. 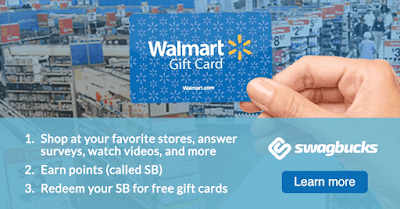 If you would like to try earning free gift cards from Swagbucks and sign up under Sarah's referral link you can click thru here to Join Swagbucks Today. She will earn as you earn. Most points earned at Microsoft Rewards are from searching thru Bing. I cash out for Amazon gift codes but they offer several others. I use Bing as default search engine. This way I earn while I search naturally thru out the day. Take daily quizzes when available. Click on the 10 point searches when available. This is the least income, but at this point I am at least hanging in there until I earn my first $10. I really don't like spending much time so I am not sure it will be worth continuing--I may do better doing a little more at Swagbucks. This site puts up a limited number of rewards the first of each month and when they are gone they are gone. I plan to get an Amazon gift card with my 10,000 points. Click on four to six articles and scroll down to earn points (you can click on 10 per day). They offer bonuses for repeat visits and other activities. These help the points add up. I still try to find good deals on the supplies I buy to make the money go further--like I've shared in this post about The Fabric & Yarn Lady's Bulk Craft Supplies on Etsy. But by working to earn money specifically for my shoebox and crafting passions I don't have to wrestle quite so much when I spend it. I hope this income will also cover the full cost of filling and shipping my dozen or so 2 to 4 year old girl Operation Christmas Child shoeboxes I plan to pack this year. Our family divides the ages of boxes between members and I am in charge of the 2 to 4 year old girl shoeboxes. 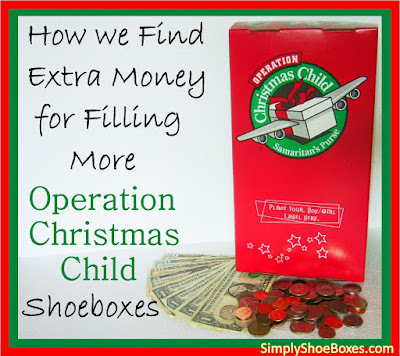 The reason I chose this category can be explained in this post: Packing OCC Shoeboxes for Boys vs. Girls and Why I Sew Dozens of Dresses. How do you support your crafting and Operation Christmas Child shoebox packing habit? Do you use any online earning sites? Which are your favorites? Click the banner below to see ways we save on our household budget to have more to spend on shoebox packing.